This is one of the easiest yeast bread recipes to make. The recipe only uses four ingredients, and makes a wonderful loaf. You can make this using all purpose flour, but the bread flour really adds a lot to the texture of the bread. Bread flour is different from all purpose flour because it contains more protein. The proteins in bread flour, glutenin and gliadin, combine when wet to make gluten, which makes a web and forms the structure that traps air. When the bread bakes, the gluten denatures, or sets, and forms the crumb of the bread. This bread is marvelous toasted, or eaten warm from the oven spread with some soft butter. 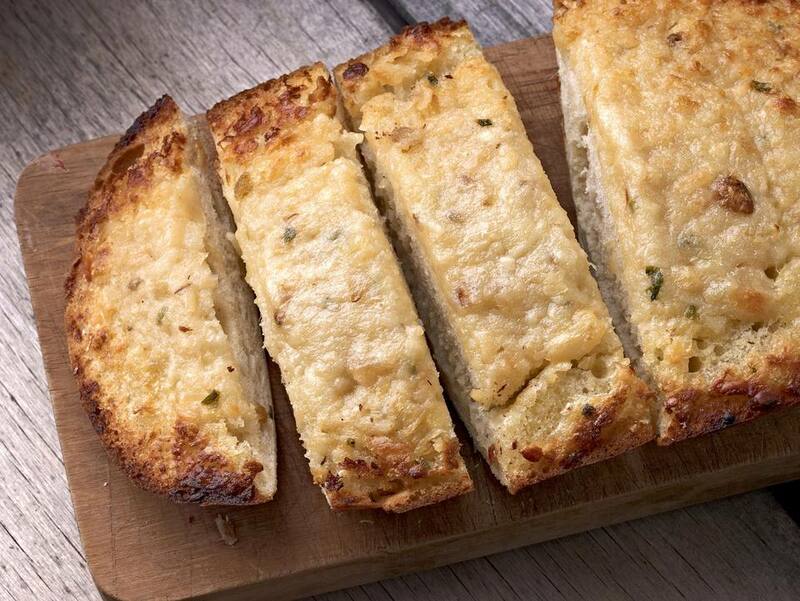 Or use it to make Toasted Garlic Bread or Toasted Parmesan Bread. Dissolve the yeast in the warm water and let stand five minutes, until bubbly. By hand, add 1-1/2 cups of the flour and the salt. Beat well for a few minutes with a wooden spoon. Gradually stir in enough of the remaining flour to make a soft dough. Knead the dough on a floured surface until it is smooth, springy and elastic, about 10 minutes. Place the dough in a greased bowl, turning to grease the top so it doesn't dry out while it's rising. Cover the dough and let it rise until double in bulk, about 1 to 2 hours. Punch down dough with your fists and gather into a ball. On a floured surface, roll the dough to a 12 x 6" rectangle. Roll up the dough tightly, starting with the 12" side. Thoroughly pinch the edges and ends of the dough to seal. Roll and stretch dough carefully into a long, narrow shape, making the ends thinner than the center. Place the loaf, seam side down, on a greased cookie sheet that has been sprinkled with cornmeal. Cover the loaf with a clean kitchen towel and let it rise in a warm place until doubled, about 45 minutes to an hour. Slash the top of loaf with a very sharp knife in three places, if desired. Bake the bread at 425 degrees for 20 to 30 minutes, or until loaf is deep golden brown and sounds hollow when tapped with fingers. The internal temperature of the bread should be about 210°F. (You can, if desired, spray the loaf with water a few times during baking for a crisper crust.) Remove the bread from the oven and place on a wire rack; let stand until cool.